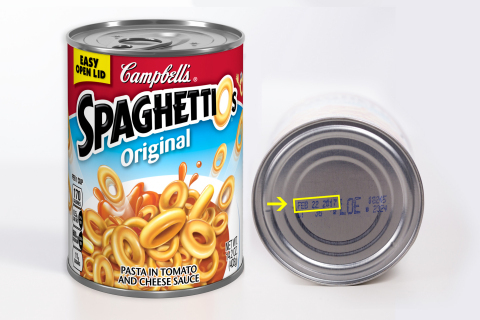 CAMDEN, N.J.--(BUSINESS WIRE)--Campbell Soup Company is voluntarily recalling 14.2 ounce cans of SpaghettiOs Original due to a potential choking hazard posed by pieces of red plastic found in a small number of cans. This plastic material is from parts of the can lining which may peel off. This product should not be eaten. People who have bought the affected product should return it to the store where it was purchased for an exchange or full refund. For more information call 1-866-535-3774 between 9 a.m. to 7 p.m. EST, Monday to Friday or visit Facebook.com/SpaghettiOs. Campbell Soup Company apologizes for the inconvenience. Campbell (NYSE:CPB) is driven and inspired by our Purpose, “Real food that matters for life’s moments.” The company makes a range of high-quality soups and simple meals, beverages, snacks and packaged fresh foods. For generations, people have trusted Campbell to provide authentic, flavorful and readily available foods and beverages that connect them to each other, to warm memories, and to what’s important today. Led by its iconic Campbell’s brand, the company’s portfolio includes Pepperidge Farm, Bolthouse Farms, Arnott’s, V8, Swanson, Pace, Prego, Plum,Royal Dansk, Kjeldsens and Garden Fresh Gourmet. Founded in 1869, Campbell has a heritage of giving back and acting as a good steward of the planet’s natural resources. The company is a member of the Standard & Poor’s 500 and the Dow Jones Sustainability Indexes. For more information, visit www.campbellsoupcompany.com or follow company news on Twitter via@CampbellSoupCo.